I don't disagree with the theme of this book. Obama is a revivalist who wants good for America. Republicans are bad. Yet I don't like the way the case for those conclusions has been made. While the book is full of analysis to the transformation of the Obama campaign as it moved to the White House and faced the realities of governing, it's light on reporting. There are no new insights into the White House as you find 'Game Change' does to the 2008 campaigns. One thing I really didn't like is making assertions about people and policies without explaining how did you jump to those assertions. One example is the description of Larry Summers. 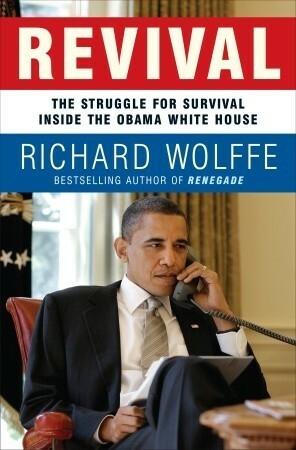 The book makes a good case for Obama. It's a good chance to see things how Obama sees them. It reflects the authors knowledge of the president. Sign into Goodreads to see if any of your friends have read Revival. I too think of Wolffe as a straight shooting analyst. I thought his documentation was more than adequate but I browsed pretty thoroughly into his acknowledgements and ref. pages. Also I had read enough in surrounding areas to give him credit. I was particularly interested to see that he was still writing from events in Aug. and maybe Sept. of 2010. Enjoyed your review, thanks.